The reasoning behind cooking with wine is to intensify and enhance the flavor of food. Wine is known to release flavors in food that otherwise could not be experienced. The following are guidelines and tips particularly directed at the novice cook or a cook new to the world of cooking with wine. Wines labeled “Cooking Wine” are typically salty and include other additives that may adversely affect the taste of your chosen menu. If you choose to use a cooking wine, adjust your recipe to reflect the salt content already in the wine. An expensive wine is not necessary, although a cheap wine will not bring out the best characteristics of your dish. The process of cooking/reducing will bring out the worst in an inferior wine. A good quality wine, that you enjoy, will provide the same flavor to a dish as a premium wine. Save the premium wine to serve with the meal. If you are intent on cooking with a premium wine, do not simmer the wine for a long length of time. To preserve a reasonable part of its flavor, cook the wine slowly and do not let it come to a boil. If you are creating a sauce through reduction (see below), cook it separately in an enamel skillet. Premium wines require careful handling, more so than good quality wine, to maximize the quality of your finished dish. For the novice it is best to use good quality, well balanced, young and powerful wines. These good quality wines will stand up to higher temperatures and longer cooking time. Save the premium wine to serve with the meal. Don’t go too cheap. Cook only with wine you would drink. The core flavor of your dish will impart the flavors of the wine you choose. If you do not like the flavor of the wine, you will not like the dish. If a wine is extremely fruity, sour, or unsavory, these characteristics will be emphasized during cooking. Wine needs time to impart its flavor, wait 10 minutes or more to taste before adding more wine. Too much wine will overpower a dish. If you are a novice at cooking with wine, start out simple. The more you cook with wine, the better you will become at predicting how a specific wine will enhance your menu. For best results, wine should not be added to a dish just before serving. The wine should simmer with the food, or sauce, to enhance the flavor of the dish. If added late in the preparation, it could impart a harsh quality. A wine that is simmered for a short time on low heat will impart a different flavor of that same wine simmered at high heat for an extended period of time. Recipes that call for champagne are generally more for effect rather then flavor. It is best to use a flat bottle of champagne. “Flat” or “still” champagne is much like a dry white but is more acidic and tends to be dryer. There are exceptions to these pairings. Until you become comfortable with cooking with wine, these are simple guidelines to follow. Refer to the article titled Pairing Food and Wine for specific wine suggestions. Definition of marinade: A liquid, such as vinegar, wine or oil, with spices or other flavorings added to it, which is made for the purpose of soaking a food in it to add flavor or to tenderize. Marinade that has been in contact with uncooked meat should never be reused. If the marinade is to also be used for basting or in a sauce, be sure to set aside some from the batch before the uncooked meat is added. Using wine as a marinade: The tannins in wine help to break down the toughness of meat, while the acidity helps to cut fat and oil. The moisture of the wine prevents the meat from drying out while cooking. Definition of Deglaze: The process of loosening and reducing the residue left in a pan after meat has been sautéed. After cooking, the meat is removed from the pan and a liquid such as wine, vinegar, stock, or juice is added to the remaining meat juices and bits. This flavorful residue combines with the liquid to produce a sauce or gravy for the meat. The longer the liquid is cooked, the thicker the mixture gets as the liquid evaporates and reduces. Cream or butter is often added to create a smoother sauce. 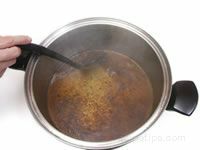 Definition of Reduce: To thicken and intensify the flavor of a liquid by boiling, uncovered, to evaporate excess liquid. This process is used generally on soups and sauces. Definition of Reduction Sauce: A sauce which uses the juices that are created from oven roasting or stove top cooking foods, such as meat, poultry or vegetables, as its base and then thickens and intensifies the flavor by reducing (boiling to evaporate the excess liquid) the juices. This liquid is strained and used as a base for sauces, soups and stews. Using wine in deglazing and reducing: Using wine in deglazing and reduction creates an intense and complex sauce. Do not use light/fruity wines when making sauce. The fruitiness is destroyed during the cooking process, leaving a highly acidic sauce. If wine becomes overly acidic during deglazing or reduction, add fresh/dried fruit to counteract. The amount of time spent reducing the wine, may be dependent on the color of the wine. White wines are cooked for a shorter period of time, long enough to burn off the alcohol. Red wines are normally cooked for a longer period to turn the typically rich purple color of the red wine into a rich red color. The rich red color blends beautifully with the deep brown color of meat. When a recipe calls for water, replace the water with a favorite wine. Mix wine with your favorite oil to baste meat and poultry. Serve the same wine with dinner that you cooked with, they will balance each other. If you prefer to use a fine wine during dinner, stay within the same wine family. The amount of alcohol that remains in your dish is dependent on the manner and length of preparation. Typically, the alcohol in the wine evaporates while cooking and only the flavor remains.